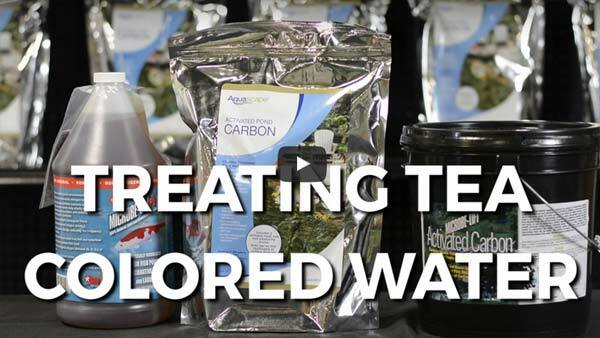 How To: How to Treat Tea Colored Pond Water There's only one thing worse than green water - and that's tea colored or brown water. Often times, the end fall, beginning of winter brings with it discolored water. The first being tea-colored water. When leaves fall into your pond and sit, they break down, releasing tannins. For the most part, they stain the water, creating a type of all-natural tea. This is the most common cause of tea colored or brown water. The second is simply free-floating sediment, which is ultimately making the water appear this color. Fish, water movement from waterfall or wind can easily disrupt this debris. To determine what's causing the discoloration, grab a glass from your kitchen, dunk it in your pond and fill it with the water. Bring it inside and let it sit for about 24 hours. The next day, take a closer look at the glass. If it's still tea-colored then you have tannin stained water. If you see particulate matter settled at the bottom of the glass then you have sediment. Once we pinpoint what's causing the discoloration, we can treat accordingly. First, clean the pond. Because both causes start with an abundance of organics, your first action is to rid the bottom of the pond of that debris. Remove any muck, leaves, etc. Use a pond vacuum, net, or drain the entire pond if necessary. For the tea-colored water, use activated carbon, which is chemical filtration. The carbon will absorb the colors, leaving behind clear water. You'll add this to a media bag and place in either your skimmer or waterfall water. Anywhere that has a constant flow. For the sediment issue, add beneficial bacteria. The beneficial bacteria will digest any accumulated organic debris and eliminate the brown water.